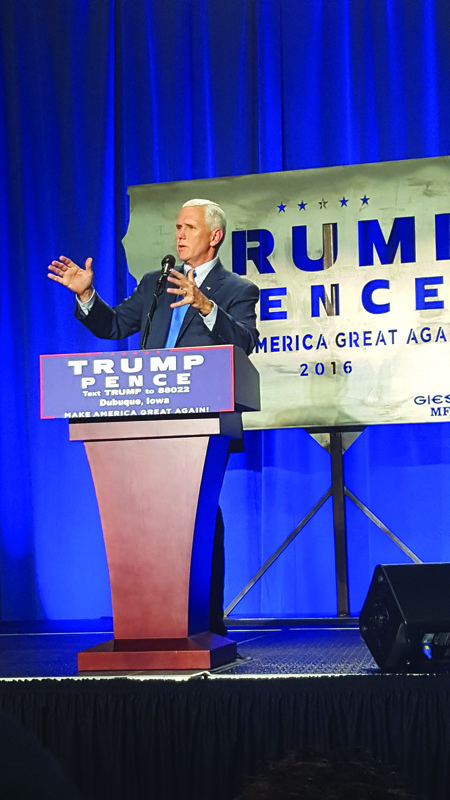 On Monday, Sept. 19, I had the pleasure to attend a rally with Vice Presidential candidate and Governor Mike Pence. There were over 200 people in attendance to hear him speak about the ideas he and Donald Trump have for the country. The rally lasted around 45 minutes and spent time highlighting the most important reasons for needing to elect Donald Trump to the White House this November. One of the first things Pence made clear was that Trump doesn’t tiptoe around the thousands of rules of political correctness. He says what he means and isn’t afraid of what he says. Another important point he made was that Trump doesn’t forget the people that built this country, he remembers the people who work with their hands. “Our campaign isn’t about insults, it’s about ideas: the economy, getting people back to work, and the Supreme Court,” Pence said, making an important focus of the Trump-Pence campaign. The Supreme Court was a major topic of the night. Most people there seemed to agree that the balance of the Court is at stake, and with Trump-Pence, judges will be appointed that respect the Constitution and don’t make laws from the bench. “Trump will always put American safety first,” Pence said speaking about the events this past weekend where bombs went off in New York and New Jersey. He made it clear that this is an at home battle because people who have been here their whole lives are becoming radicalized. He said that we need to respect our law enforcement and make sure they have the ability to do their job. Pence was a well-spoken candidate and made a case for Trump that was issue based rather than insult based. The rally was energizing and made sure that people know that Iowa is ready to stand with Trump-Pence and turn Iowa red this November. A symbol of hate or lifestyle?